Karl Benjamin, a major Southern California painter and one of the original hard-edge abstract painters, opens an exhibition of paintings at Brian Gross Fine Art on Thursday, September 9th with a reception from 5:30 to 7:30pm. In this important third exhibition with Brian Gross, Benjamin presents selected paintings from his Alphabet Series: 1964-1965. The exhibition, which continues in the vein of Karl Benjamin's two previous shows with Brian Gross, Stripe Paintings: 1979-1981 and (Mostly) Random Rectangles, celebrates the artist's intensive examination of color relationships. 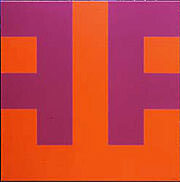 The title for this exhibition, Alphabet Series, owes both to Benjamin's playful nature and to a casual observation by a viewer that the geometric shapes in the paintings reference the alphabet. While the forms may appear letter-like, the brilliant interlocking shades of magenta, orange, blue, green, yellow and red create an intriguing composition without beginning or end. 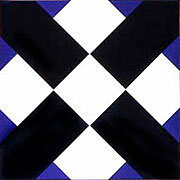 The deceptively flat surfaces give each work a unique optical presence. Bold pattern and flat color resonate in these dynamic abstract canvases. In 1959, the Los Angeles County Museum of Art organized a landmark exhibition entitled "Four Abstract Classicists" presenting works by four Los Angeles artists: Karl Benjamin, Lorser Feitelson, Frederick Hammersley and John McLaughlin. The show's curator coined the term "hard edge painting," noting their similar stylistic concerns. Their works are characterized by clean edged, interlocking geometric forms rendered in flat color and occupying the entire picture plane. More recently, Benjamin's work was included in Claudine Humblet's definitive work on American abstract painters, La Nouvelle Abstraction Américaine de 1950 à 1970 (Skira, 2003). Karl Benjamin was born in Chicago, IL in 1925. He received his BA from University of Redlands, Redlands, CA and his MFA at Claremont Graduate School, Claremont, CA. 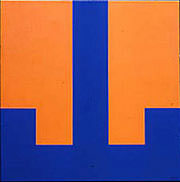 He was awarded the National Endowment for the Arts Grant for Visual Arts in both 1983 and 1989. His work has been featured in numerous museum exhibitions and is included in the public collections of the Los Angeles County Museum of Art; Museum of Contemporary Art, Los Angeles; Museum of Modern Art, Israel; Oakland Museum, Oakland, CA; San Francisco Museum of Modern Art, CA; Seattle Art Museum, WA; and the Whitney Museum of American Art, NY, among others. For many years, Benjamin taught painting at Pomona College and Claremont Graduate School, and currently is Professor Emeritus. He lives in Claremont, CA.